Standard sturdy double wall fabrication. Inner & outer chambers made out of thick mild steel/Stainless Steel sheet. Inner chamber backed silver paint finish and exterior finished in hammertoe. Gap between two walls filled with glass wool for temperature insulation. 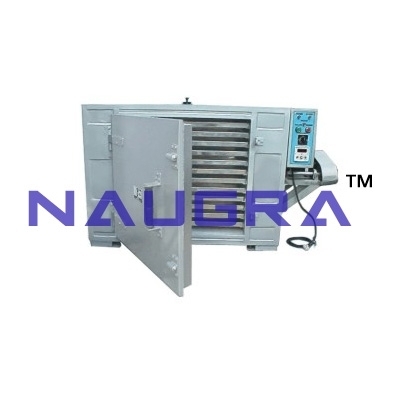 Heavy duty forced air blowers are provided to constantly circulate hot wall door is mounted on heavy hinges and provided with heavy moulded latch. Temperature is controlled by a thermostat. It can be read on dial type thermometer. Temperature Range: 50 o C to 250 o C Tray Capacities. Other Related Teaching Lab Products, Scientific Instruments and Educational Equipments like Naugra Lab Tray Dryer. . .